Last Friday Herefordshire Council unanimously declared a Climate Emergency. It was an inspiring day. About a hundred of us old environmental activists were outside the Shirehall when along came about one hundred and seventy young students who had marched chanting from the collages, down Aylestone Hill and through High Town. Our councillors had seldom, if ever, seen so much support for a motion to be passed. Yesterday the same council approved their own Transport Package, which essentially commits them to spending vast sums of money on road building and peanuts for walking, cycling and public transport. This, of course, is exactly the kind of policy that shows they are not serious about the Climate Emergency that they themselves had declared just a few days earlier. It reflects the muddled thinking of governments around the World, who continue to give billions in subsidies to keep the old fossil fuel industries going, while at the same time professing to be concerned about climate change, ecological breakdown and appalling air quality. It is why more and more people are taking to the streets globally, with groups like Extinction Rebellion and School Strike for Climate Action, demanding immediate and decisive action. This coming Friday, 15th March, there will be a global school strike for climate action. As of this morning 1209 actions in 92 countries have been announced, and many more are being added each day. I follow many of the organisers on Twitter, and these young people, some only ten years old, are so powerful and eloquent speakers. They put most of our elected politicians to shame. We need to make policy and investment decisions fit to the physical realities of the ecological crisis. Take road building. While our local council’s top priority seems to be to build ever more roads George Monbiot suggests a target of reducing car use by 90% over the next decade. Halting the manufacture, sale and use of fossil fuel cars, lorries and buses is a political decision. As I have repeatedly argued on this blog battery electric and hydrogen fuel cell alternatives already exist, and having most of the cars in car sharing clubs rather than private ownership we can further decrease the damage they do and the space they take up. If we are serious about action on climate change, or children’s health, or the liveability of our cities, then we have to make planning policy decisions in the understanding that the era of the privately owned motor car is over. This entry was posted in Climate Change, Global, Local, Transport on 12 March 2019 by Richard. The World is getting warmer. This graph depicts the global temperature changes from 1880 to 2018. The data on which it is based is from the NASA Goddard Institute for Space Studies and the graph is courtesy of Levke Caesar. This week in the UK we’ve been enjoying unseasonably warm weather. Lots of us have been outdoors actively making the best of it. However there is also the worrying knowledge that this lovely weather is not how February in UK should be. Weather records are being broken all over the world. Some of these events are pleasantly enjoyed by millions, such as this warm spell in the UK. The other side of the coin is that many people are experiencing life threatening weather events: floods, droughts, hurricanes. What is of course most worrying is that the warmer global temperatures are increasingly triggering a number of feedback loops. Ice is melting from the Arctic to the Antarctic causing sea levels to rise. As the oceans warm the water expands, further adding to sea level rise. Less ice means more of the sun’s energy is absorbed by the ocean, further contributing to warming, and to sea level rise. As the sea warms methane is released from the ocean floor. Permafrost is melting releasing more methane and carbon dioxide, further intensifying climate breakdown. As atmospheric carbon dioxide levels increase the oceans absorb more carbon dioxide, turning some of this into carbonic acid and thus making the oceans more acidic, with potentially catastrophic results for humanity. The science is clear. We need to get to a zero carbon economy as quickly as possible. As I’ve repeatedly said on this blog, we have technological and political choices. Our politicians consistently hold on to outdated concepts, like economic growth and national self interest. The young people involved with school strike for climate, and so many of us in ecological activist groups like Extinction Rebellion, understand we need system change, not climate change. If our species is to have a future we all must start acting in the interests of our own species, as a unified collective entity. We all need a stable climate and a fully functioning biosphere. That will entail reallocating resources on an epic scale. It will involve the closing down of many industries, and the expansion of others. Our decisions will need to be guided by the ecological imperative, and that will need to trump all concepts of profit and power. A big ask, but absolutely necessary. This entry was posted in Climate Change on 28 February 2019 by Richard. Last March I posted a blog about the great success of the Ampere, the first regular passenger ferry using battery electric propulsion, rather than diesel engines. It achieved 95% reduction in emissions and an 80% reduction in operating costs. In that blog I argued that it was likely that short routes, such as the Dover – Calais, would probably switch from diesel to renewables before longer, ocean going routes. However a new partnership between the car maker, Renault, and ship building start-up Neoline are planning a predominantly wind powered regular Trans-Atlantic service, due to start operating in 2020. The picture above shows what they are proposing. It is quite a large roll-on roll-off ship, capable of carrying 478 cars on two decks. Most of the time while at sea it would be entirely sail powered. For manoeuvring in port and times of slack wind a diesel engine is planned. I would like to see Neoline replace this diesel with a hydrogen fuel cell engine. However, even with the diesel engine, emissions are forecast to be 90% lower than conventional ships as essentially this is a new iteration of a sailing ship, although no doubt with smart computer controlled sails. I have on this blog written about several experimental hydrogen fuel cell ships. Now construction is just beginning on what will be the world’s first regular commercial hydrogen fuel cell ferry. It will be a 70-foot long catamaran, capable of carrying 84 passengers, and will commence operating in San Francisco Bay sometime later this year, initially on a three month trial basis. It will carry sufficient hydrogen for two full days operation. Combining the sail powered ship designed in France by Neoline and the hydrogen fuel cell ferry under construction in California seems to suggest the path to a truly sustainable global shipping technology. Predominantly wind powered, but with clean hydrogen fuel cell technology for manoeuvring in port and as back up for when the wind is not strong enough. How long will it be before these technologies replace diesel on the huge bulk carriers that criss-cross the planet’s oceans. That would improve local air quality in ports, cut carbon and other emissions, and be quieter and so less disruptive to whales and dolphins, and it might also be considerably cheaper than dirty old diesel. What’s not to like? This entry was posted in Transport on 15 January 2019 by Richard. For the last few years on this blog I’ve chosen a person and/or a technology to celebrate as the Person of the Year or Technology of the Year. I try and highlight ideas, people and technologies that might help humanity move to a better future, where climate breakdown is averted, mass species extinction halted and where people can live in a peaceful and prosperous manner, without wrecking the planet in the process. The hydrogen fuel cell is my technology of the year. Lots of companies and research programmes have made important progress over the last twelve months, and many of them I’ve written about. In September I posted two blogs on the subject, here and here, and one in March. We have the science that informs us we must combat climate change and the technologies to do so. Our planet is dominated by politicians who don’t want to understand the dangers or learn about better ways of doing things. Carbon emissions rose last year, when the science tells us they need to be falling fast. The biggest and most positive thing to happen over this last year has been the emergence of a new generation of climate activists. In August the 15 year old Swede Greta Thunberg started her school climate strikes, taking every Friday off school to protest outside the Swedish Parliament. Her tweets and videos have gone viral and young people in hundreds of cities around the World have joined her in going on school climate strikes. In October Extinction Rebellion launched its programme of non violent direct action in London, and it too has rapidly become a global phenomena. Linked with these street based activist movements has been the growth of political movements advocating radical action on climate breakdown. In October I blogged about Green Parties gaining ground in elections in Luxembourg, Belgium and Bavaria, and during most of November and December most of my blogs have been about the growth of this climate activism, especially with the emergence of the Sunrise movement, the Justice Democrats and Alexandria Ocasio Cortez since the American Midterm elections in November. In Britain, where our politics in general seems so totally dysfunctional Caroline Lucas seems to be the most popular politician, and the only member of Parliament backed up by policies that might yet avert the worst. If I have to pick one person to represent this global wave of climate activism it would undoubtedly be Greta Thunberg. Do please watch this two minute video of her addressing COP 24 in Katowice, and check-out her Twitter for more news and videos. This entry was posted in Climate Change on 30 December 2018 by Richard. There is an utter disjunction between what science informs us is the predicament humanity finds itself in and what politicians are prepared to do. The science is clear: we need to get to net zero carbon emissions as fast as humanly possible. In the 1970’s we had the opportunity to reduce emissions in a gradual and orderly manner. That window of opportunity is now closed. Now our only hope for continued existence of our species is an almost unimaginably fast reduction in emissions, yet this year emissions increased. If they continue to increase for just a few more years it is simply ‘game-over’ for our species, and countless others. National governments everywhere are failing us. They range from the actively destructive, like USA, Russia, Saudi Arabia and Brazil to the well intentioned but hopelessly under ambitious such as most of Europe. As Greta Thunberg has said, our leaders are behaving like children. The thing that gives me most hope is the extraordinary explosion of citizen activism for climate action. The school strikes for Climate that Greta started in August has now spread globally and a whole new generation of activists are taking on leadership roles, many of whom are only children. Linked to this is the growth of the Extinction Rebellion movement, the Sunrise Movement and the Justice Democrats in USA, Green Parties across Europe and many other grassroots movements. One of the key things these groups are doing is trying to get politicians to declare a Climate Emergency. Many councils in the UK and elsewhere have now done this, and this public acknowledgment of the problem is an important first step. Some of the declarations call for net zero emissions by 2025 or 2030, which is a scientifically necessary goal. Given the best organised and most dedicated local council in the world would probably struggle to achieve this the question then arises, how do we achieve it for the entire global economy, including in those places where governments are most actively hostile to such action. That bigger goal can seem hopeless, but hope is only born through action. Once people see dramatic and positive action in one place it can spread globally at lightning speed. On Twitter I retweeted someone called Sydney Azari’s Tweet ‘We are on the event horizon of revolutionary change.’ This is an interesting concept. For humanity to survive in any kind of civilized state we need change on a scale and speed never envisaged before, the outcome of which is not knowable in advance, and for which there is no manifesto or political theory. It has to be powerful enough to sweep away dozens of governments, technologies, industries and the whole of global consumer society. What will replace our current systems has to fit within the biological and physical laws of nature. The COP climate talks in Katowice, Poland, are drawing to a close. The UN Secretary-General Antonio Guterres has said failing to agree climate action would ‘not only be immoral’ but ‘suicidal’. The path governments are committed to is suicidal. Hope lies out on the streets, with the youth, and with the millions of people trying to build that radically more sustainable future. This entry was posted in Climate Change on 13 December 2018 by Richard. The American midterm elections are over and what they reveal is something very similar to what is happening in Europe; the rather flabby, corporate centre ground is collapsing and voters are moving out to the extremes. In Europe, where most countries have at least half a dozen parties in their national parliaments these trends are reflected as the emergence of some parties and the contraction of others, whereas in USA the trends take place within the Republican and Democrat parties. In a blog a couple of weeks ago I looked at the growth of Green parties in elections in Belgium, Luxembourg and the German state of Bavaria. Since then the German state of Hesse has had elections that reinforced this message, as again the traditional mainstream parties lost ground to both the far right AfD and to the Green party. The best analysis of the midterms that I have read has been Paul Mason, and he is very good at identifying the demographic groupings that are driving the Trump phenomenon and its antidote, a much more socially caring and ecologically literate movement of more urban, educated, cosmopolitan and racially diverse people. Within the Democratic Party they form a democratic socialist grouping. For years Bernie Sanders was just about the only person representing this more radical perspective. Paul Mason identifies many of the emerging people and ideas within this movement. I want to focus on just one person. If Trump embodies all that is bad, then, for me, Alexandria Ocasio-Cortez embodies all that is good. In a Tweet the meteorologist and commentator Eric Holthaus described Alexandria Ocasio-Cortez as “the only American politician I’ve ever seen with a climate change plan that is in line with intergenerational justice.” She also has some refreshingly radical ideas on inequality, gun crime and much else that is so dysfunctional about American society. Action on climate change in America has been lead from academia by people like Mark Z Jacobson, through the courts by Our Children’s Trust and though grassroots campaigns by the likes of 350.org. Now at last these people have someone within the House of Representatives who really is focused on the same kind of actions that they are demanding. 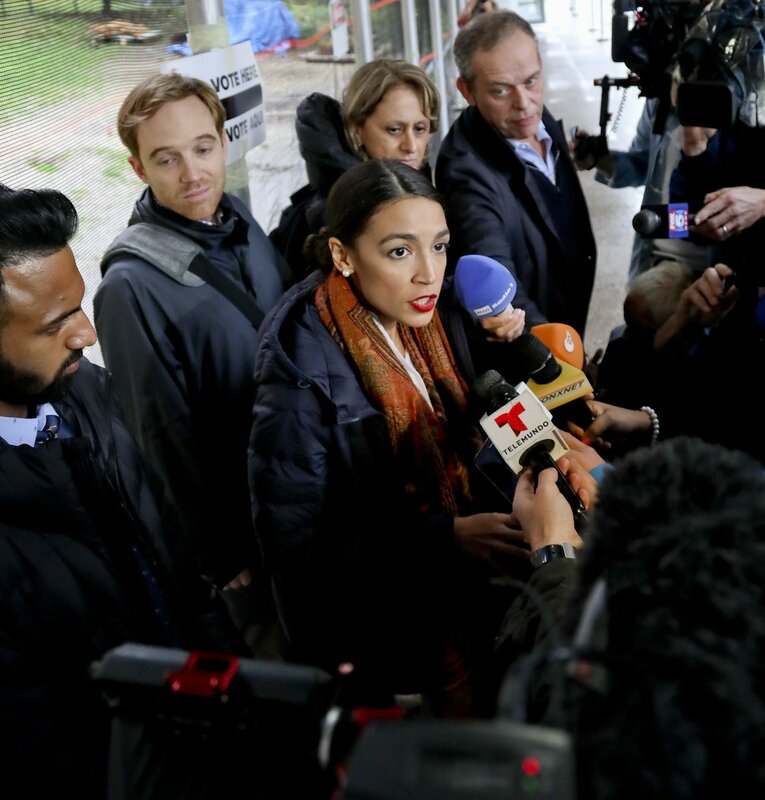 Millions of us around the World are delighted to see someone like Alexander Ocasio-Cortez emerging as a true leader, and I for one would love to see her become President of USA. As she is only twenty-nine years old she has time ahead of her, but why not as the presidential candidate in 2020? Who better? This entry was posted in Climate Change, Politics on 8 November 2018 by Richard.